At least 12 rockets have struck Israeli soil in the year since the 2014 Gaza war - not counting dozens of rocket strikes which hit Gaza. Israel promised following Operation Protective Edge in Gaza in summer 2014 that a cessation of hostilities would "bring quiet" to Israel and the region. One year after the war officially ended, however, a close look at IDF and Israel Security Agency (ISA or Shin Bet) figures reveal that southern Israel has never been "quiet" from rocket fire for more than three consecutive months. Twelve rockets and mortar shells have landed in Israel since August 27, 2014, Channel 2 revealed Friday - one per month on average. No injuries have been reported over that year. Rockets struck Israel in September, October, and November 2014, followed by three months of quiet from January 2015-March 2015. 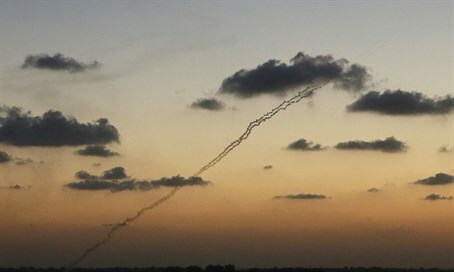 Tensions flared again in April 2015, when one rocket struck Israel - followed by a three-rocket salvo in May, and rockets in July and August. These figures do not include the dozens of rocket attacks from Hamas, Islamic Jihad, and other groups from Gaza, nor from terrorists along Israel's southern and northern borders. Over a one-year period, the IDF officially attacked 14 terror targets in Gaza since the war ended, most of them Hamas. None of the cease fires following Israel's recent wars have brought the "quiet" that the international community has promised. One year after Operation Cast Lead (2009), no fewer than 217 rockets struck Israel; in the year following Operation Pillar of Defense, 36 rockets struck Israel.